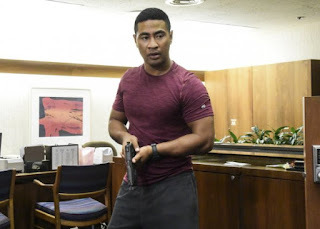 Hawaii Five-0 - Kau Ka 'Onohi Ali'i I Luna - Review: "The Royal Eyes Rest Above"
Instead of opening on a hapless victim or a cold-blooded killer, tonight’s Hawaii 5-0 episodes presents us with vignettes about the two newest members of the team. Junior and Tani have both had to do a lot of heavy lifting this season. While Tani has fit in well with the team since the beginning, the strange choice to make Junior Steve’s roommate and not a full team member has kept him isolated from the larger ongoing plots. Sure, he gets some moments now and then, but he hasn’t really been given an opportunity to test his mettle. This changes when Junior (after a brief and very awkward conversation with his ex-girlfriend) notices an old vehicle with blacked out plates while on his morning jog. The four men carrying empty double bags confirm his worst fears. He’s outside a bank about to be robbed. Junior is wise enough not to tackle this task on his own, and immediately calls Steve for help. Steve is in the middle of an airport pick-up, welcoming an old face and new addition to the main cast. Like Junior, it’s a little unclear how Adam is going to fit in the bigger picture, but it’s nice to see a returning cast member. 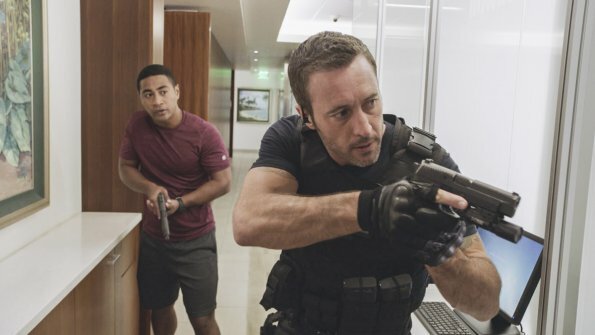 Steve is happy to see him too, even if he’s disappointed that Kono didn’t show up with him. 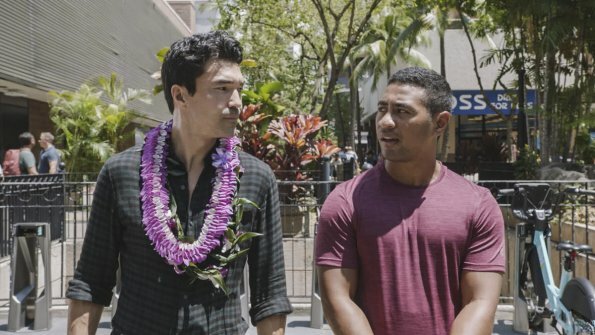 Adam tells him that Kono is still on her crusade against the trafficking ring, and admits that it’s hard to be mad at someone who is trying so hard to help the vulnerable. 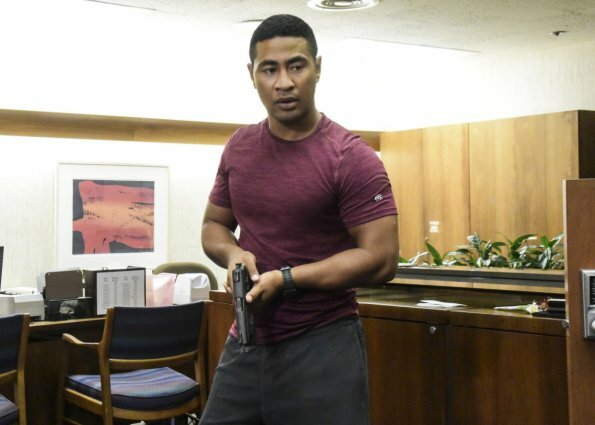 Still, there’s more than a note of bitterness in his voice when he tells his friend that he’s resigned to living his own life until Kono returns. 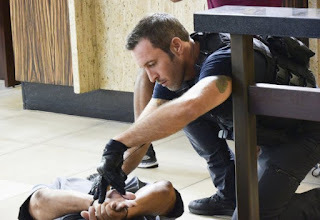 Steve, who understands Kono’s mission better than anyone, assures him that she’ll come home. Before he can say anything more, Junior’s call for help comes through. Steve affirms Junior’s suspicions. Robbers have breached the bank and taken hostages. Adam immediately notices that there’s something suspicious about the scene. The robbers didn’t bother leaving a look-out or the getaway car running (I guess Adam is going to add a criminal mind to the team dynamics). Steve assumes that the robbers are just bad at their jobs and decides to go in himself. That, of course, does not go over well with Junior. When Steve goes through the service entrance, he follows him in like a lost puppy dog. Adam follows as well and suddenly Steve has an entire team to help him confront the heist crew. Not that that’s necessary. These robbers aren’t looking for confrontation. They lock themselves in the vault and set of an explosion. They then escape through a pre-dug tunnel. Steve, of course, decides to follow them and once more tells Junior to do the smart thing instead the brave thing. Junior does what he’s told this time, and trusts Steve to take care of himself. Tani and Lou show up just as the terrified hostages are fleeing the bank. Jerry plays navigator as Adam and Junior follow Steve aboveground, while Lou and Tani try to make sense of the scene back at the bank. 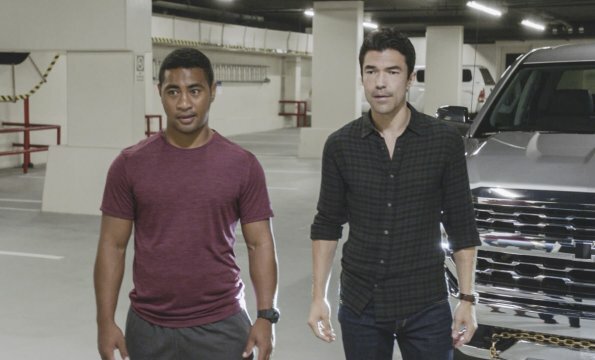 As Steve sneaks around in the tunnels, Adam, who is obviously playing the role of Danny in this episode, takes a few liberties with traffic laws to stay in pursuit. Bank robbers aren’t what await Steve at the end of the tunnels, but a police officer. In the heat of the moment, he accidentally shoots the officer. Steve’s focus immediately shifts from tracking down the villains to helping their victim. Despite Steve’s makeshift first aid and Adam’s quick driving, they aren’t able to save the man. Steve obviously takes it very personally. Lou tries to console him, but Steve doesn’t want to hear any friendly words of wisdom. He blames himself for what happens and channels his energy into finding the men who put him in that position to begin with. Some investigating by Jerry reveals the thief’s haul (ten million in cash that’s probably connected to organized crime) and a possible inside man (bank teller Bobby Akamu). Steve’s moral crisis is resolved by the next commercial break. The cop he shot wasn’t a cop at all, but a bank robber in disguise. 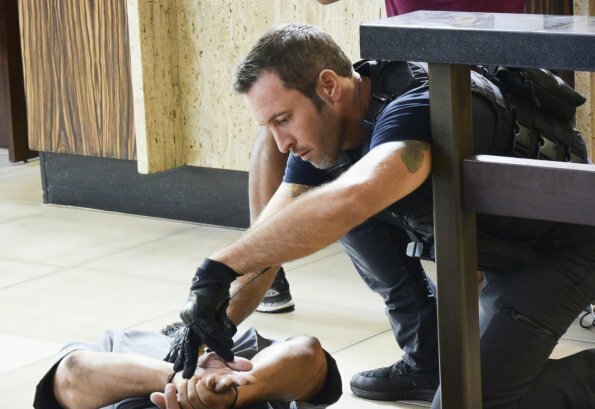 It’s a little annoying that the show goes with a cop-out (pun intended) instead of trying to tell a deeper storyline about the mistakes anyone could make. Steve switches from feeling guilt over the robber’s death to immediately trying to use it to flip Bobby. Unfortunately, someone got to him first. The other robbers also have cop uniforms good enough to fool Palace security. 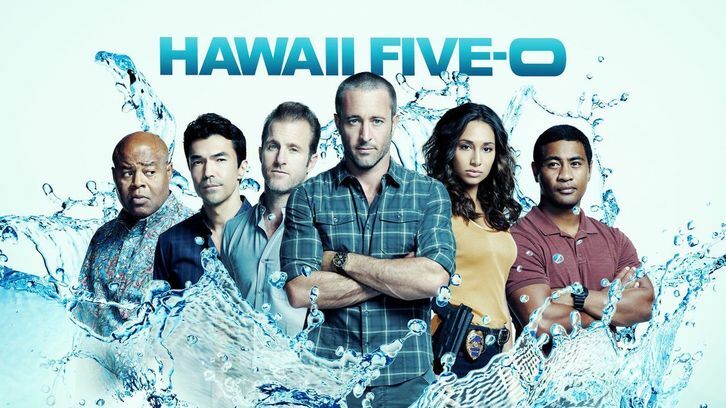 They waltz into Five-0’s operation and silence Bobby before he can reveal their identities. 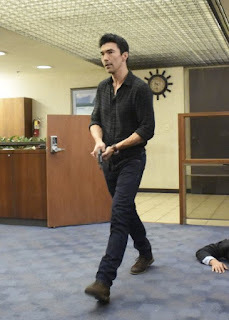 Lou and Steve give chase and get into a gunfight with the rest of the robbers. The bad guys are brought to justice and, in a nice little visual joke, the ten million recovered from the truck on their car. While the A-plot was typical of a fast-paced, streamlined episode, Tani’s B-plot leaves a lot to be desired. Maybe it’s because her brother Koa has been given such a shallow character so far. It’s hard to buy in to Tani’s dilemma when we don’t care about her brother. When Koa constantly refuses to even admit that his older sister might have a point about his lifestyle, it can be a frustrating watch to see Tani give up so much for him. Her risking her job to warn Koa of a drug bust is a dumb move, and she’s incredibly lucky that it was caught by Lou. Lou tells Tani not to be so hard on herself and gives her some good advice about moving past her mistakes. She decides the first step in doing so is to tell Steve about her run-in with her brother.